UPMC’s Finance Management Rotation (FMR) program is a three-year immersive leadership development program that provides participants with three, one-year rotations in various areas throughout finance and accounting. Graduation day is marked on your calendar, but you’re not quite sure yet what direction your future is headed. Is the FMR program a good thing to apply to? Would you be a fit? 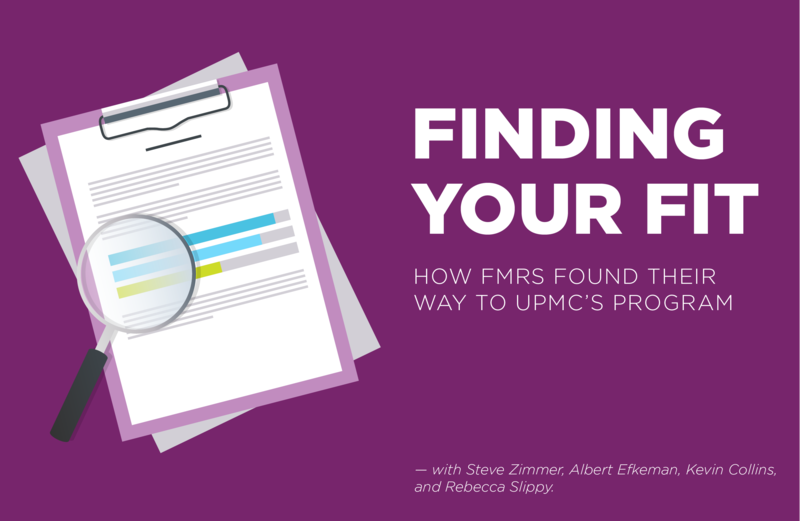 We sat down with four current FMRs here at UPMC to ask them a few questions about how they knew they were a fit for UPMC’s FMR program! Steve Zimmer: I was an Accounting and Finance double major. Albert Efkeman: I majored in Finance with a double minor in Economics and Entrepreneurship. Q: How did you find the FMR program at UPMC and why did you apply? Kevin Collins: Throughout college, I knew I wanted to work at a company that made a difference in the community. That’s what first drew me to UPMC. Steve: I wasn’t sure which career path was right for me. When I learned about UPMC’s Financial Management Rotation (FMR) Program, I liked that I’d have the opportunity to work both in finance and accounting roles. Albert: Like most college students (and Steve), I had no idea what I wanted to do after I graduated from college. With all the uncertainty in my future, I started to look at rotational programs in the Pittsburgh area. I wanted to find a program that would allow me to not only apply my multiple concentrations, but develop as a leader. While doing research I came across UPMC’s Financial Management Rotation Program. This was the perfect fit for me because it would allow me to rotate through all of the different aspects of a large company. It also would allow me to learn from senior leadership and analysts on how to handle myself in the workplace. Q: What really sparked your interest in the program? Steve: Coming out of College, I gained an interest in the health care industry. Since 2010, one can argue that no industry has gone through as much change as the health care industry. UPMC has been a leader in the industry during this time of change, and having the opportunity to join an organization like UPMC was intriguing. Albert: Like Steve said, I was also very interested in the health care industry. Health insurance has been one of the fastest growing industries in the United States over the past decade, and UPMC has been a leader in that growth. After being a Finance Summer Associate, I realized that health care finance would be a challenging environment that would help me develop my technical skills. Health care finance is a very complicated industry that allows you to learn something new every day. I realized that I would never have a boring day at the office, and would continue to be challenged on a daily basis. Kevin: It is clear from the beginning of doing your research into this program that even though you are not working directly with the patients, sound finance can help free up the funds necessary to provide life-changing care. Q: What’s has the transition been like from college student to FMR? Rebecca: You often hear life after college referred to as “the real world,” but here’s an important thing to keep in mind: “the real world” is a lot like college. As someone who recently made the transition from college student to financial analyst, I can attest that while life is different once you begin working, I have been able to adapt with relative ease by realizing the following similarities between college and the workplace. At college, you have learned to develop a new routine each semester based on your classes and other activities, which will help you to transition easily into new rotations and responsibilities. Additionally, there is a wide variety of activities you can become involved in. Often in college, students are involved in several clubs, sports, Greek Life, or other activities that interest them. The FMR program offers these same types of opportunities. With 3 different FMR committees (Social and Service, Quality and Innovation, and Communications) there are different ways to become involved with the program. There are also numerous opportunities to volunteer and participate in service events, or to attend social gatherings get to know your co-workers. Q: Any last advice for someone considering applying to the program or accepting an offer to be an FMR here at UPMC? Kevin: I want to say that I know it’s scary to accept an offer during your senior year of college. It’s an exciting time to have earned a job, but there is always apprehension because you want to be sure you made the right choice. For me, choosing the FMR program was not only the most comfortable choice, but it was also the right one. The style of the program is shaping me into a well-rounded employee, and the structure will really help you decide where you fit at UPMC. The three years in the program will help a scary decision become a well-informed one at the end of your last rotation. Rebecca: While there are a lot of differences between being a college student and working as a financial analyst, there are a lot of similarities too. Try not to become overwhelmed by the upcoming changes in your life, but rather focus on what is familiar about your lifestyle. Remembering that you still have daily commitments, activities to participate in that interest you, and that there is always more to be learned will help to aid you in the transition from college student to FMR.